11/23/2009Share this story on Facebook! Learn more about Ithaca's assistive technology lab. Consider a career in speech-language pathology, one of today's fastest-growing professions. Shanan Glandz '09 contributed to this story. How does a child fill his pillowcase with candy on Halloween night if he isn’t able to say trick or treat? If he’s lucky enough to work with graduate students in the assistive technology lab at the School of Health Sciences and Human Performance, he can get hooked up with a mobile communication device that, at the press of a button, will shout it out for him. The assistive tech lab, part of the larger Sir Alexander Ewing Speech and Hearing Clinic, has a dual purpose -- to educate students and to provide specialized services to the local community. People of all ages and differing communication skills, from stroke victims who’ve lost the ability to speak to children who’ve never been able to, come to the lab because of the sophistication of the equipment. “We have clients who have disabilities from cerebral palsy to global developmental delays to autism,” says clinical instructor Tina Caswell. Students get hands-on experience showing these clients how to work with a wide range of state-of-the-art technology. And what technology it is. The walls are lined with adaptive computing devices such as joysticks, alternative digital keyboards that assist nonreaders using voice commands and symbols, and eyeglasses that act as a mouse, allowing patients to control the computer with just head movements. There are also lower-tech options, including a range of toys that children with impaired motor skills can play with at the touch of a button or flick of a switch, and mobile messengers that allow nonverbal patients to communicate via a computer and a small speaker. Having the opportunity to work with this cutting-edge technology was part of what drew Jennifer Grove, M.S. ’09, to Ithaca College. “Actually getting to learn it, to see it, to touch it, and to try it was really amazing to me,” she says. This equipment is available to undergraduate and graduate occupational therapy, physical therapy, and speech-language pathology and audiology students to empower their patients and connect them to the world. Laura Badger, M.S. ’10, took on a client as part of her Augmentative and Alternative Communications (AAC) class, an 11-year-old boy whose cerebral palsy has rendered him nonverbal. With Badger’s help, the boy has learned to use the technology in the lab to express his thoughts and emotions in ways he never could before. “You can see that he has so much to say, so it’s just about trying to break it down to a level that he can work at right now,” explains Badger. 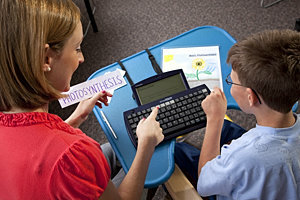 Badger’s client uses a computer program called Writing with Symbols, which allows him to type words and use picture icons to write text. To speak, he uses an AAC called a DynaVox MT4, giving him the ability to hold conversations and express his thoughts. The lab has its own DynaVox communication boards ranging in price from $100 to $7,000. These boards have symbols and pictures that can be produced right in the lab, where they are linked to their respective spoken words. Then users can hold conversations through the touch pads. Having such sophisticated technology in a clinical education setting is beneficial for clients, who come from all over Tompkins County. But it’s also beneficial for IC students, who gain valuable experience using the tools and interacting with a variety of professionals in their fields. The lab provides learning opportunities that cannot be found in a lecture hall or textbook. After working with her own client, Badger feels more confident in her abilities as a speech pathologist. “Not a lot of schools offer this type of experience; you usually have to go elsewhere to work with this population or be exposed to the level of technology that’s out there,” she explains. And with expanding technology comes expanding opportunities for Ithaca College students to have access to the latest advances in the field.